We are glad to announce the release of 2016.06 CarteBlanche Ukraine map version for CarteBlanche Navigator, iGO 8 and iGO Primo applications! The total road network coverage is increased by 1 000 km and constitutes 477 000 km. Renamed over 900 settlements as well as over 1 000 street names due to the implementation of the decommunization law all over the country. Khmelnyts'ka oblast': Muksha Kytaihorods'ka (Zhovtneve), Slobidka-Humenets'ka. The total street network coverage is increased by 0.1% and now constitutes 53.7% by population. Address search covers 46.9% by population. 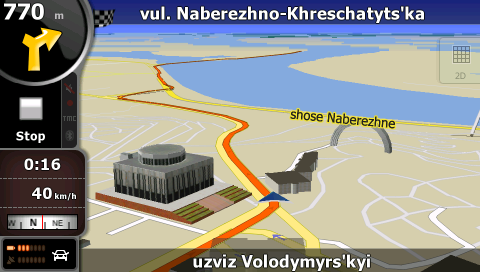 Street network and address database of the cities of Kirovohrad and Kam'ianets'-Podil's'kyi are substantially updated. Number of POIs is increased to about 82 760. A large number of feedback messages are processed. Therefore, now CarteBlanche Ukraine map 2016.06 contains a detailed coverage of 942 settlements (53.7% of the Ukrainian population), including 184 cities; almost all of this coverage (46,9% of population) includes address search. The map features a detailed coverage of all settlements in 11 districts of Kyivs'ka oblast' (Bilotserkivs'kyi, Borodians'kyi, Boryspil's'kyi, Brovars'kyi, Kaharlyts'kyi, Kyievo-Sviatoshyns'kyi, Makarivs'kyi, Obukhivs'kyi, Pereiaslav-Kmel'nyts’kyi, Vasyl'kivs'kyi and Vyshhorods'kyi), in-block passages in many cities. The total length of road coverage is 477 000 km, including a large number of unpaved roads. Legal users of CarteBlanche Navigator, iGO 8 and iGO Primo software can download the new map version from NNG official map update portal, www.naviextras.com. The portal is available in 10 languages, including Ukrainian. We also thank our customers once again for the feedback and ideas on how to improve the map. Suggestions that were not taken into account in this version of the map will be considered in the next releases. We are glad to announce that the 2016.06 version of Carte Blanche Ukraine NT map is now available for Garmin® and Kenwood® navigation devices! We thank our customers once again for the feedback and ideas on how to improve the map. Suggestions that were not taken into account in this version of the map will be considered in the next releases.